Eroded beaches, a non-existent tourist trade, and skyrocketing property taxes...this is what Abbie Sinclair stumbles into when she goes to Stargazey Point to recover from a traumatic event. Devastated by her own personal tragedy, Abbie thinks she has nothing left to give, but is slowly drawn into the lives of the people of Stargazey Point - the three elderly Crispin siblings and their struggle to stay in their historic beachfront home; the young, handsome architect, Cab Reynolds, who left behind a successful career to refurbish his uncle's antique carousel; and a motley crew of children who touch Abbie's heart in a variety of ways. Before she knows it, Abbie is helping the people of Stargazey Point revitalize their dreams. In doing so, she's surprised to find her own dreams for life rekindled and even more surprised to find a place she might call home. Author Shelly Noble's novel is an insightful, hopeful look at the way we can recover from what seems insurmountable tragedy. I'm always impressed by the human spirit at work, and the way an ordinary group of people can achieve extraordinary things when they come together for a common goal, whatever it may be. Stargazey Point is a novel about just this kind of effort, and I was immediately drawn into the story and interested to see what would become of each character. 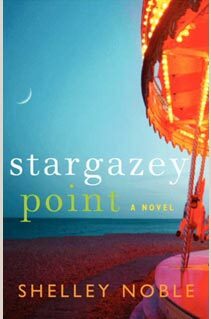 Stargazey Point is another perfect summer read...so grab a copy and enjoy it while there's still some summer left.